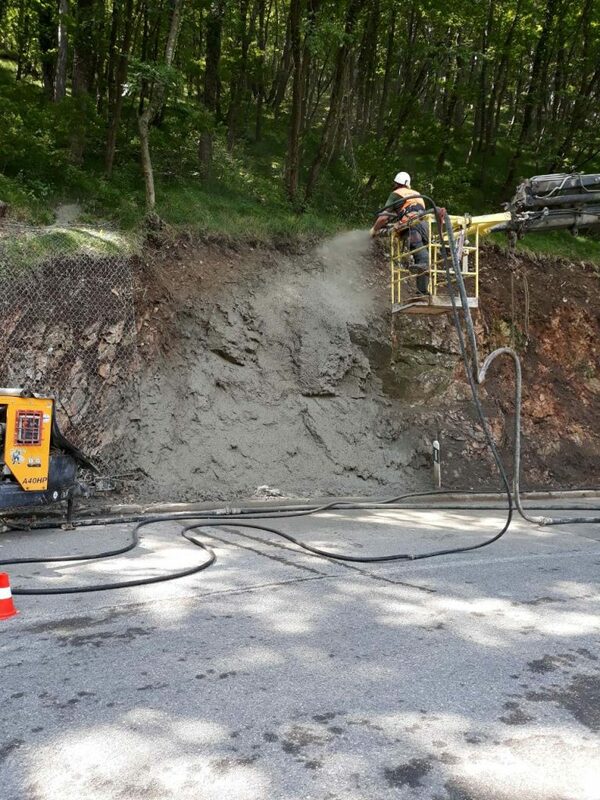 Geotechnical works on protection of slopes on parts of state road D501, between Hreljin and Križišće are in progress. For these parts of state road D501 we have already carried out exploration works and made the main design and detailed design. 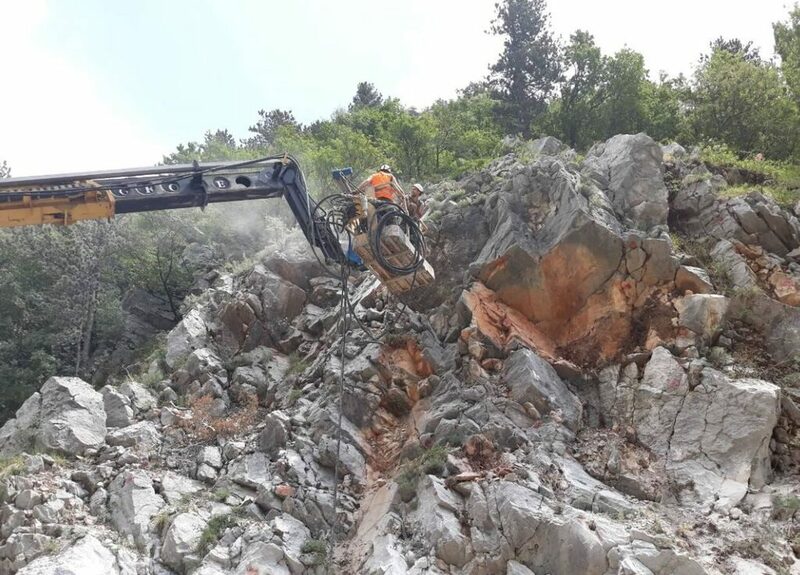 State road D501 was conduct with cutting in natural terrain. As a result, opened cuts 2,0-18,0 m in height were formed in rock mass in the total length of 300 m. The largest part encompasses subvertical or very steep slope, while some parts of the slope are overgrown with ivy. 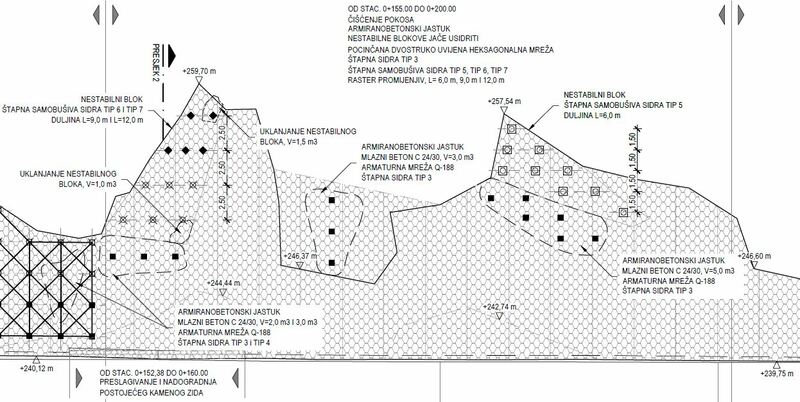 Engineering-geological and geotechnical exploration works were carried out for the purpose of slope protection design (geotechnical part). Rock slope is separated into six (6) individual engineering-geological blocks, each with specific engineering-geological characteristics. Engineering-geological mapping of the slopes determined engineering-geological properties and mechanisms of potential, previous and present instabilities. 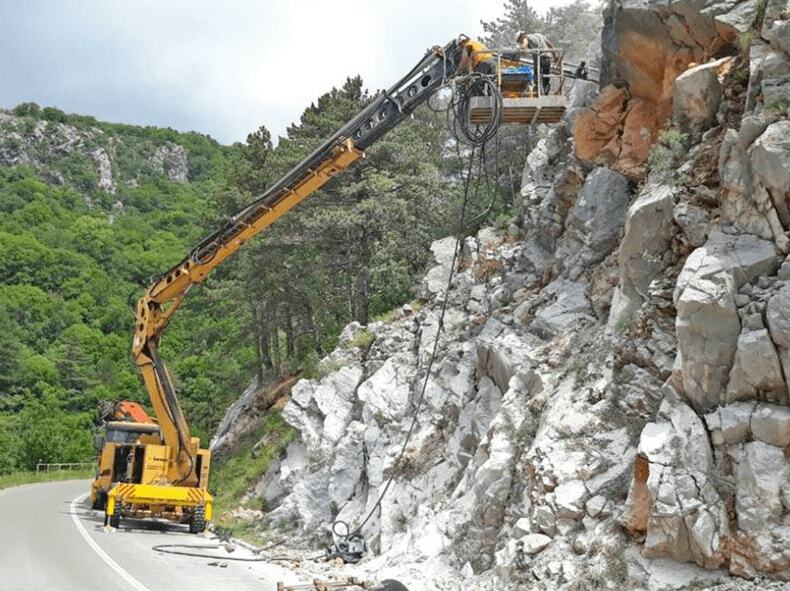 As part of the slope protection, works are planned for the purpose of increasing slope stability and rockfall protection. 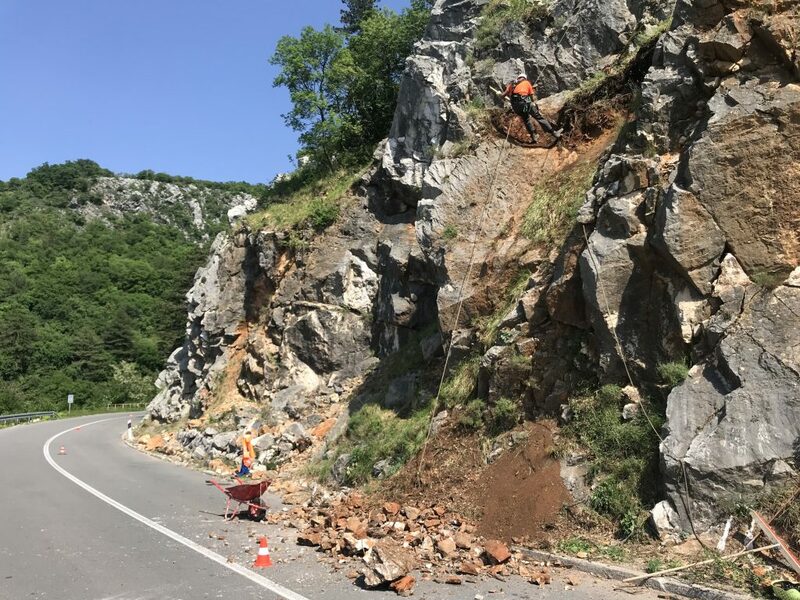 Before the start of slope protection works, slope was cleared of vegetation, clay, stones and loose blocks up to 50.0 kg (by blowing under pressure or manually). 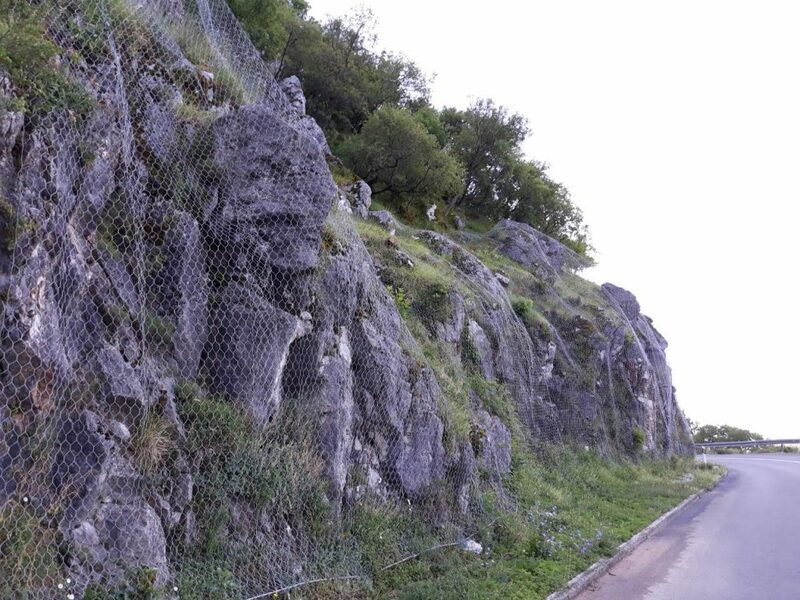 Beggining of the slope section covered with ivy, after clearing of vegetation, clay, rocks and loose blocks, was protected with the execution of shotcrete leveling layer, rock bolts (length L = 1.0 m) and shotcrete C 24/30, 10.0 cm in thickness (two layers of 5.0 cm and mesh Q188). Self drilling rock bolts diameter Φ 32, length L = 3.0 m, combined with shotcrete, reinforced mesh and drains were built in to prevent further rockfall of smaller unstable blocks in order to eliminate any hydrostatic pressure behind shotcrete. Stability of the larger unstable blocks determined by engineering-geological mapping was ensured with execution of self drilling rock bolts (length L = 6.0 m, 9.0 m and 12.0 m and diameter Φ 38). 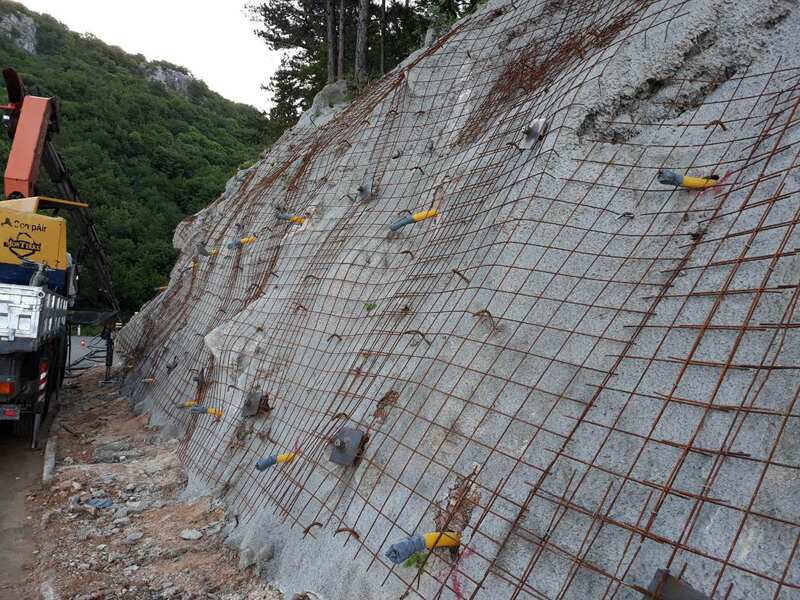 Galvanized double twisted hexagonal protective steel mesh 8×10 was executed on parts of the slope to prevet rockfall. Filling of major irregularities and cavities in several slope sections was preformed with reinforced filling. The reinforced fillings are made so that the reinforcement mesh Q-188 spirally bends and applies to larger irregularities in the slope surface. If necessary, applied reinforcement can be fastened to slope with rock bolts before executing shotcrete.